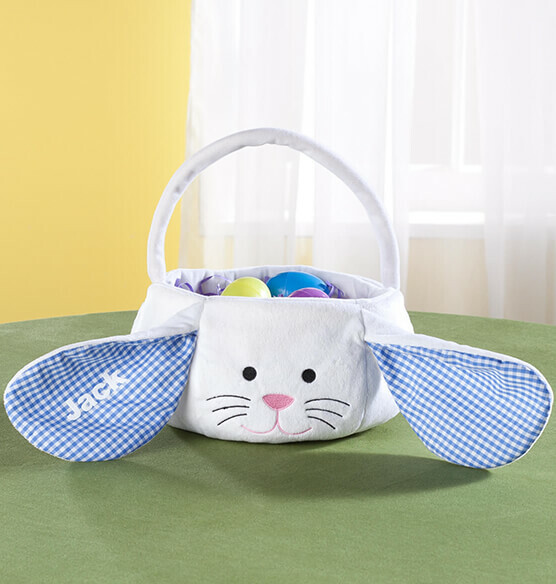 Create big smiles when you present this personalized Gingham Easter Bunny Basket to an eager child. 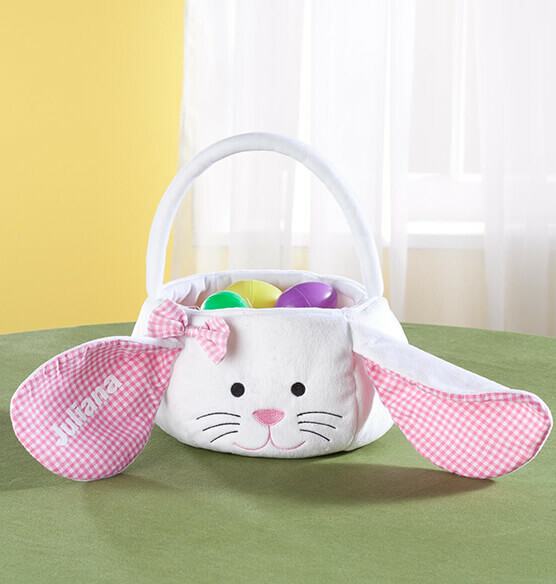 This plush white Easter bunny basket features a cute bunny face and the floppy inner ears are crafted of pink or blue gingham, depending on your choice. One ear is personalized with the name of your child, or grandchild, for an adorable keepsake that can be filled with goodies again and again. Adorable. The names are painted on. I thought they would be "embroidered". But bunny baskets look nice. The inside of basket needs to be strengthened with 3 large sheets of bunched up colored tissue paper. To give it stability. Otherwise the candy and storybook would flop out or just sag down in the bottom. (Perhaps a circle of cardboard, covered with fabric or tissue paper would have sufficed?) I didn't have cardboard handy. The finished product is adorable. Children always love personalized gifts. I love the engraving offer with this product. Small but perfect for one year old! "Smaller then I thought, but that could be a good thing"
I bought these for new step grandkids. They are a little smaller then I thought. But so much candy is not good the little ones anyway. So this could be a good thing. The price was right. the ears appear to be backwards and it's annoying. These were for our 2 and 4 year old grandchildren and I won't be using them. I also bought 5 of the other style and the ears have little wires you can bend and make the ears stand up. Their names are on the front instead of the ears so they are more functional. I only bought the other kind because there is a handle. It's a cute idea and the picture is adorable. The ears seem to be on backwards because the white side flops to the front always. The checkered side displays to the back and has a cheap sticker for the name. 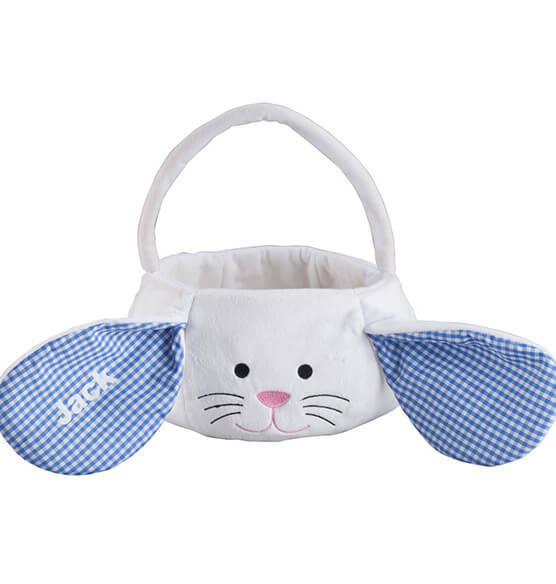 blue personalized felt bunny basket ears backwards? I think maybe the ears are sewn on backwards? It seems the only time you would ever see the baby's name is if you 'posed' the basket and had the support of a solid flat surface to keep the ears in that position. To me, that is plain silly and I didn't envision it that way. I envisioned the children running around at the Easter egg hunt with their names showing not a solid white felt ear. I bought 2 of these for my nieces' babies and was a little embarrassed when they asked me why the names weren't showing when you held the baskets or carried them around... and of course I had been wondering the same thing. I bought these baskets more for a functional use as opposed to using them as a decoration on a table. I previously ordered one and was very pleased with quality,color and size. Been looking around for an Easter basket. Found this looks cute and really good price. Three granddaughters under 3 years and thought this would be something they could use and keep for the years they hunt Easter eggs.